Friday I stepped outside my home around noon to walk to the mailbox. I’d been working the morning through and hadn’t been out since I took my daughter to school, but it was still dark then. I rounded the corner of the front and there in the concrete driveway just outside the garage door lay two greyish bluish birds. 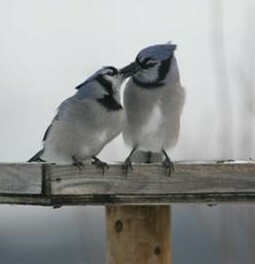 They were in the jay family of some sort, but not bright enough to be a blue jay. I suppose they may have been kingfishers, but i don’t think so. One was male. The other was female. You could tell by the brightness of the coloring. Their little claws were curled up underneath their bodies and their eyes were open although they saw nothing. No markings on the body; no trauma, no shots from a boy with a BB gun, no arrows, nothing. The birds looked healthy enough, except for the fact that they were dead. I looked up and noticed a blur of feathers on my daughters window directly overhead. Suddenly I knew. On a gorgeous spring day two lovebirds doing what male and female of all species do, they were flying high and soaring, enjoying each other with playful whims and delightful fancy. I’ve seen birds do this, so have you–they dart in and out flying fast through trees and above the water as they call to each other with their many syllabic chirps, “Hey lover,” and “My you’re fast” and “Come fly away with me,” and other playful invitations to romance. Swept up in the revelry of pheromones and the prospect of dalliance, they were not paying attention. I shudder to think of the sudden last moments of consciousness as love turned to death, falling together to earth with full hearts and broken necks. That is where I found them. I named them Romeo and Juliet and put them in a shallow grave. Love is a man splendid thing, but the world is dangerous. Previous Post WHAT THE DEUCE IS THAT?